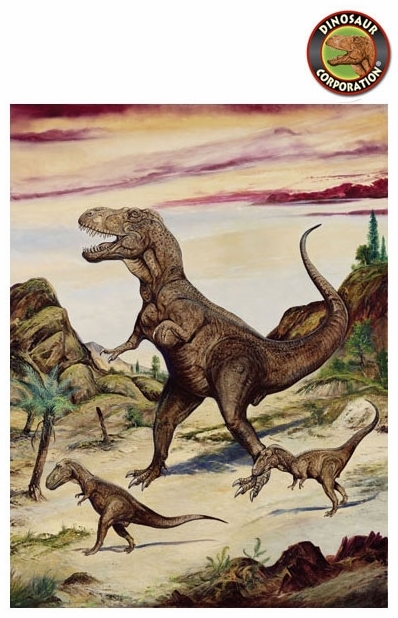 Home | WALL STICKERS | Dinosaur Wall Mural Tyrannosaurus rex with Babies 45" x 60"
Dinosaur Wall Mural Tyrannosaurus rex with Babies 45" x 60"
Dinosaur Wall Mural Tyrannosaurus rex with babies. Original oil painting by Josef Moravec. TYRANNOSAURUS rex was one of the most awesome creatures that have walked on the earth. T-rex was one of the largest meat - eating dinosaurs, having a skull up to 5ft long and many sharp teeth reaching lengths of 6in (15cm). The first complete Tyrannosaurus rex T-rex skeleton was discovered in 1902, and many great examples have been unearthed over the last fifteen years. TIME - 65 - 68MYA, Late Cretaceous period. RANGE - USA Colorado, Montana, N. Dakota New Mexico, Wyoming, Canada Alberta, Saskatchewan. DIET - The T-rex was a carnivore. SIZE - Height up to 20ft (6m) and lengths up to 49ft(15m).. WEIGHT - 6.5 US tons.